My thesis work explored creating a corporate training workshop that fuses biophillic design, the Natural Step and applied improvisation to help connect employees to pro-environmental behaviors. The goal in this project was to challenge accepted practices to make them more sustainable. I chose to redesign the bagging part of picking up after one’s dog. Using plastic or biodegradable plastic bags is an accepted part of dog ownership, yet plastic bags essential “entomb” the dog waste in landfills, since landfill conditions are not ideal for biodegrading. I designed a paper pulp clam-shell type dog waste pick up for use in residential or municipal specialized pet waste composters. The objective in this project was to reflect and map my goals in creative leadership. I created a dashboard with metrics highlighting elements I desire to cultivate in myself. The map is a visual representation of my leadership journey over the semester with destinations and routes on the way to becoming a creative leader. The journal parallels my path on the map as I explore my past, present and future leadership goals. 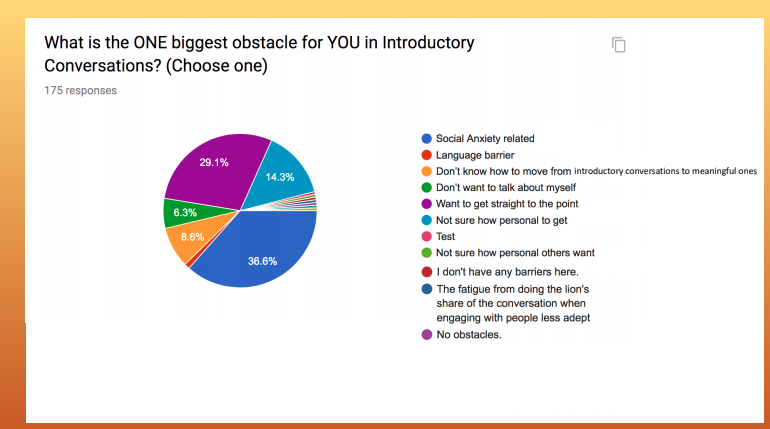 For my independent practicum, I researched qualitative surveys and surveyed 200 people online about perceptions around sustainability communication. I also conducted 18 in person interviews on the subject. 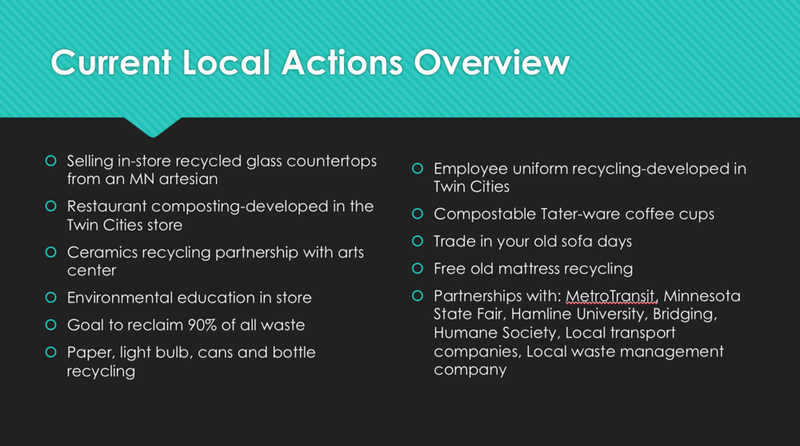 In this course, I examined the larger problem of how to reduce e-waste in Minneapolis. 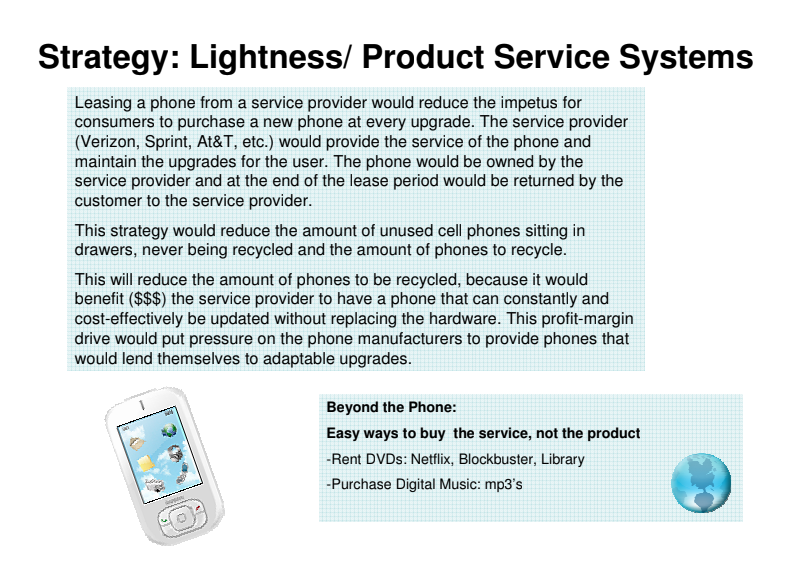 In my project, I addressed specifically how to reduce physical waste from cellphones. I highlighted the practices of buying services rather than products, planning for changes and designing phones with stock sets of parts. The goal of this project was to identify a specific group and create a manual of sustainability to meet their unique needs. The group I chose to address was early-to-mid 20s, middle class, female, young professionals. 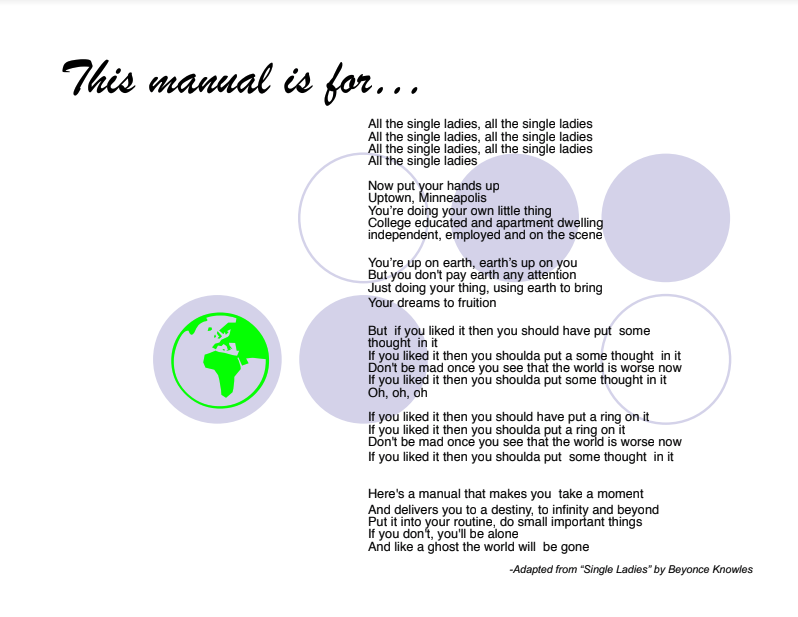 I created a guide that mirrored the voice of many popular women’s magazines and provided easy access points to introduce environmental initiatives into their daily lives. 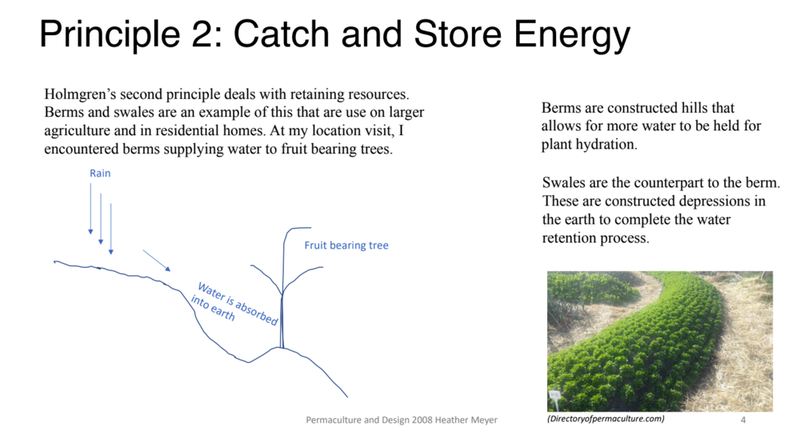 In this class, I visited locations to experience permaculture firsthand and identified the 12 Principles of Permaculture as stated by David Holmgren. I visited the home of Terry Afors in Savage/Prior Lake area of Minnesota. In my project, I reported on the styling of berms in the garden to utilize rainwater and hydration of plants, the efforts to manage wildlife naturally to the fact that the home itself was upcycled from a model log home used to sell the designs of the home, to a now actual home. In this project, I put my skills in action to redesign an everyday object. I chose to examine the low-end custom branded “disposable” pen, the kind that are frequently given out at conferences and in at front desks. Using the principle of reducing weight, one of my designs was a new pen that eliminated the areas of the pen that did not function as a rest for a person’s hand. Another design involved reducing the weight of the product and incorporated the ink cartridge as the pen casing itself to eliminate two separate parts that would need to be manufactured. In this project, I created a sustainability plan for a company. I researched a small theatre group in Minneapolis called Swearing Jack Productions. 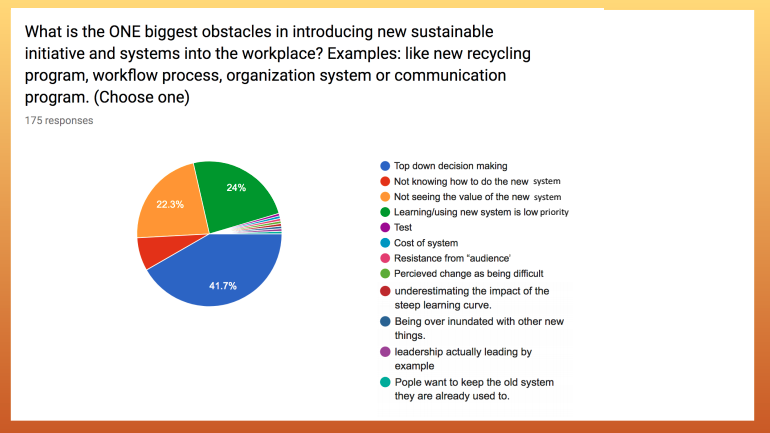 Then I identified their current challenges with sustainability and made recommendations on how to make more environmental sound choices in their work. The biggest takeaway was the idea to create or partner with other similar sized arts companies to make a way to share physical resources (tools, props, costumes) to eliminate waste and to allow the financially challenged small companies the ability to have access to resources they otherwise could not afford. In this course, I studied system thinking and applied it to existing organizations. 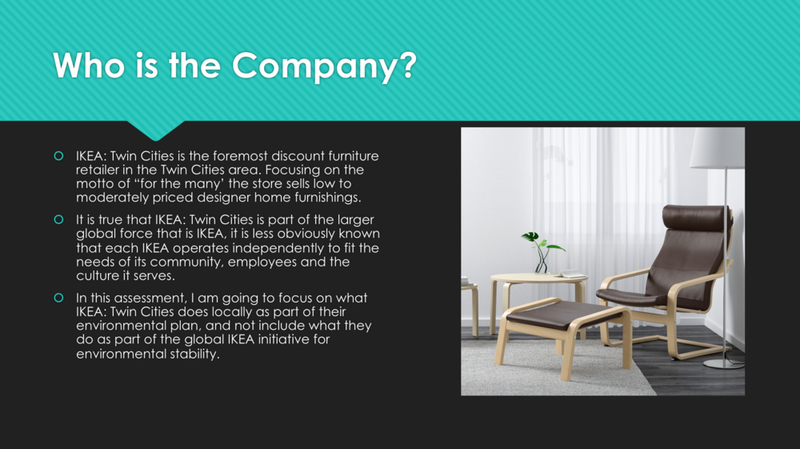 I explored the sustainability practices locally of IKEA: Twin Cities. For my hands-on project I interviewed the environmental coordinator, took a tour of the facility and identified successful systems of sustainability and areas for growth. In this course, we did a personal inventory of our own sustainability in multiple ways: environmental, intellectual and in community. I found many areas that I could improve on and some areas that I was already practicing sustainability. This was an extremely personal reflection-based class, and I am most proud to share my work in worm composting. 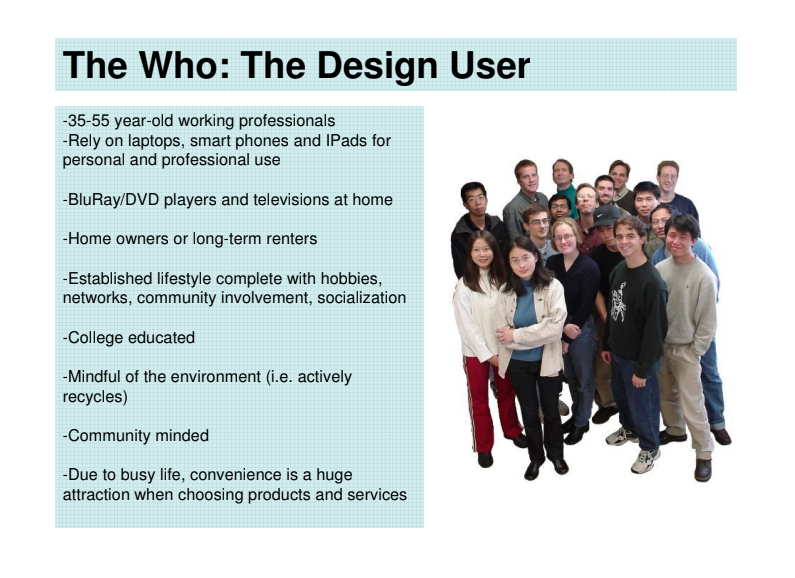 This was my first course in the Sustainable Design Program at the Minneapolis College of Art and Design. I’ve always had an interest in environmental-minded behaviors and was drawn to begin this program through a desire to make an bigger impact. 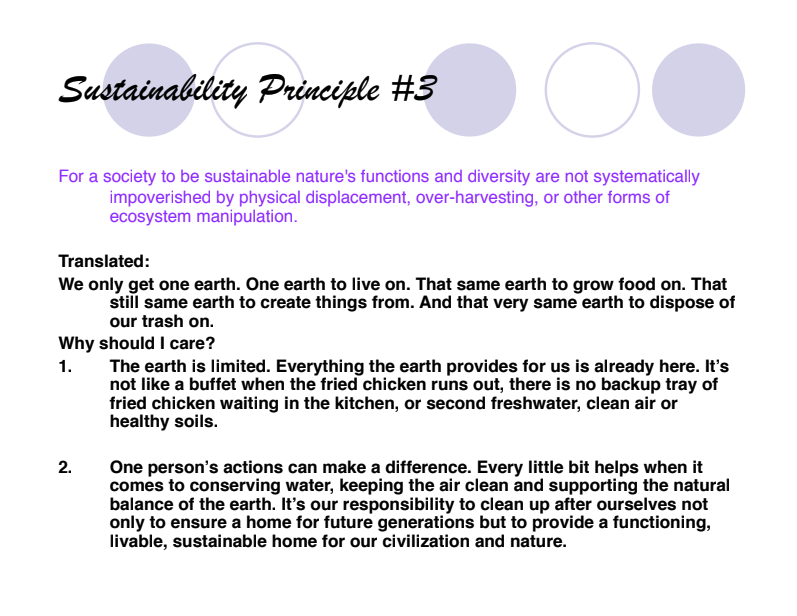 Yet, even with these beliefs already in place before this class I had not really seeing the scope of what being sustainable meant beyond recycling. The most impactful work in this course for me was exploring my response to the idea of“Spaceship Earth.” Spaceship Earth being the idea that we are all living, working, using and relying on this one planet we have, that all individuals rely on the same resource, this earth. With that singular reliability, challenges arise through geographic distribution of resources, culture ideas of the earth, behaviors of political leaders, beliefs of religions, the needs of people. Even with all of those constantly evolving participants, Spaceship Earth is all of our transport and home. Much like taking responsibility for our health, I reflected that examining how we can extend sustainable thinking to be a part of all of our of behaviors is necessary to continue to take care of our spaceship.